Author’s Note: This is part two of a three part series. To read the first post, click here. I hope I didn’t leave you hanging too much in my last post! (ha ha). Obviously I made it to the water village in one piece, despite the insanely dangerous driving of our hired rookie cabbie. My stomach felt a bit queasy upon our arrival an hour an a half later. But I was happy to be alive. The water village of Zhouzhuang is located about 37 miles outside of Shanghai in Jiangsu Province. The town is one of the best known water villages in the area (the tourist signs proudly state “China’s #1 Water Village!”) and its history dates back over 900 years. Most tourists choose to visit Zhouzhuang for its cultural history as well as gorgeous canals which has led some people to call Zhouzhuang “The Venice of the East”. Our guide Gloria had a wealth of knowledge about the village and I took pages and pages of meticulous notes during our tour. Gloria began the tour by telling us briefly about the history of the village. 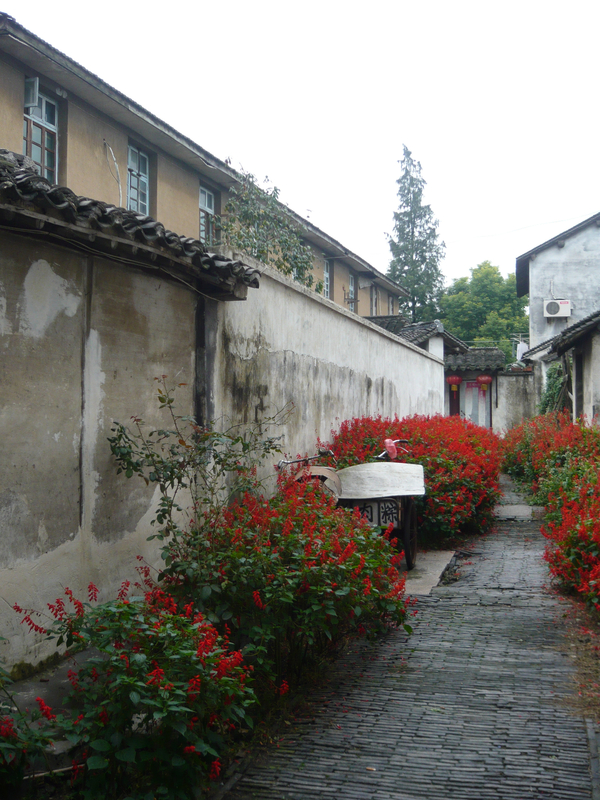 Zhouzhuang was not the original name of the village. Apparently the village was first called Zhenfengli and was part of the fief Yoacheng in the time period from 770 BC-476 BC). 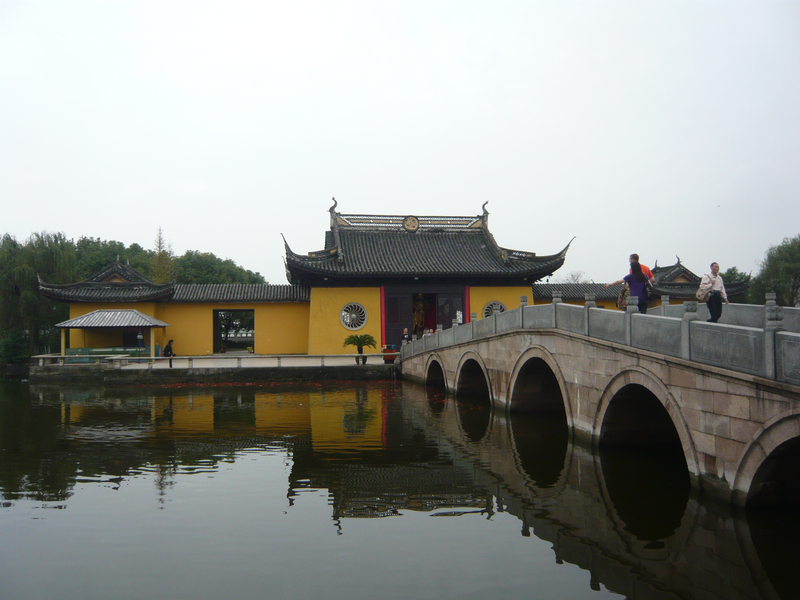 Zhouzhuang changed its name in 1086 win a very devout Buddhist named Zhou Digong donated the land to the local temple, Quanfu Temple. 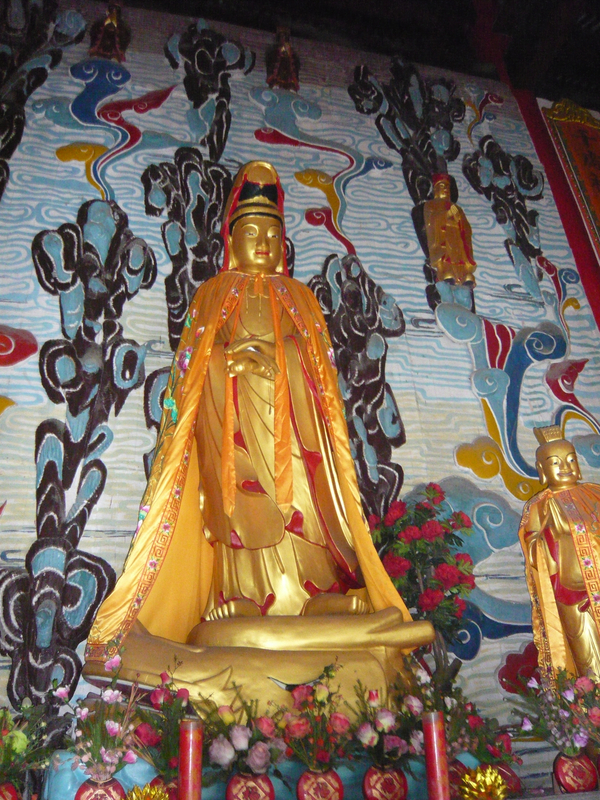 “Zhou”, his surname, was combined with “Zhuang” which means village, to honor this man for his gift. 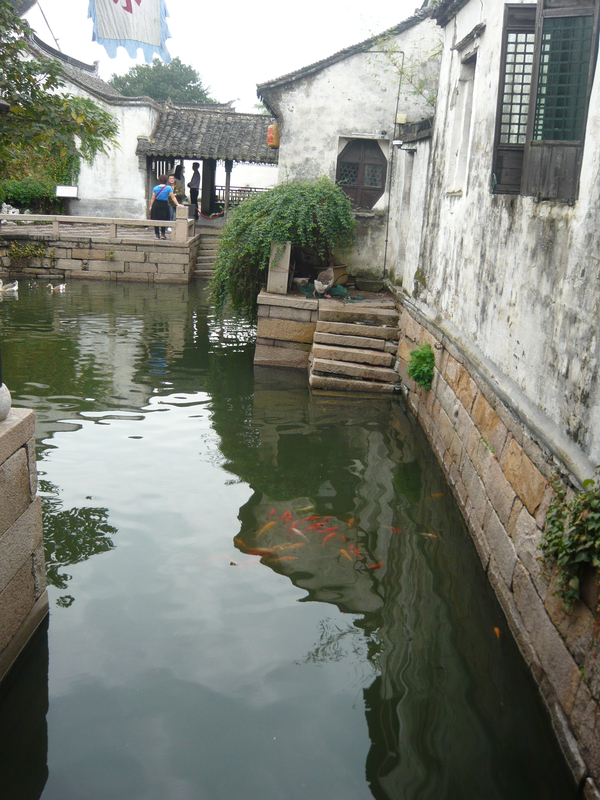 Throughout the region surrounding Shanghai, many water villages popped up over the years, given the areas wealth of lakes and rivers that eventually lead out to the sea. Shanghai’s key location on the Huangpu River which links to the Yangzi River and eventually leads to the sea, made water village an important commercial hub for fisherman and farmers living in the areas fertile lands. The entrance to the town of Zhouzhang is not impressive. In fact I was wondering what on earth we were getting ourselves into when we first pulled into the village to use the public toilets. As a general rule, I always like to use the restroom before a tour and knowing a public toilet is usually hard to find in foreign countries, it is best to not take a chance. The moment I stepped out of the cab, I instantly regretted that choice. The stench infiltrated our noses making my already nauseous stomach reel. The conditions were horrendous and not up to par with what I’d seen for public toilets in Beijing (where the government added thousands of new toilets before the Olympics). Thankfully we got back into the cab and headed the short five minutes further to the start of the actual water village. I was relieved to see that it was much more delightful than the rustic, dirty public toilet. We were dropped off with Gloria and on our way for a two-hour fast-track tour of the water village. As we entered the water village, I was instantly entranced. It was absolutely serene and just as I had imagined. I closed my eyes and pictured the villagers living here hundred of years ago and transporting everything by boat. It was a peaceful image and China has done an excellent job preserving the beauty and serenity of the place without making it a tourist trap. 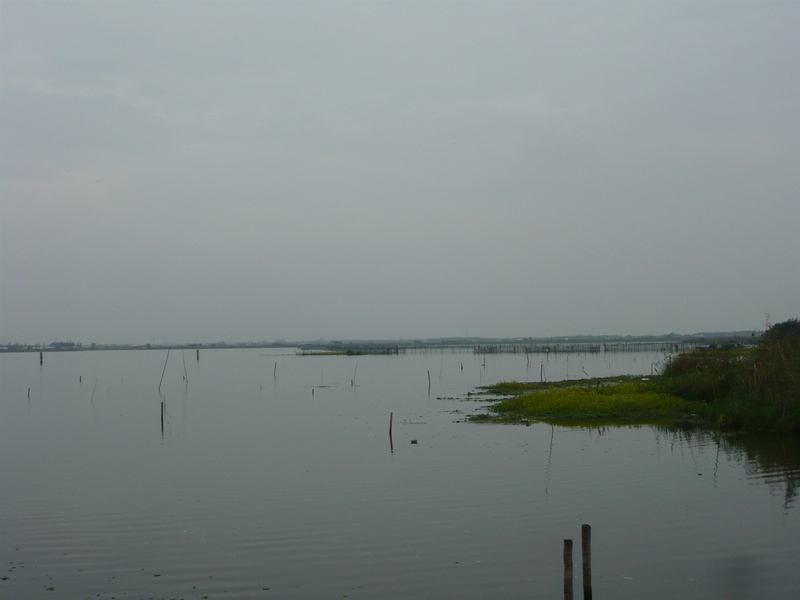 Per Gloria, the water village occupies 0.4 square kilometers and has a population of 1,000 families today. 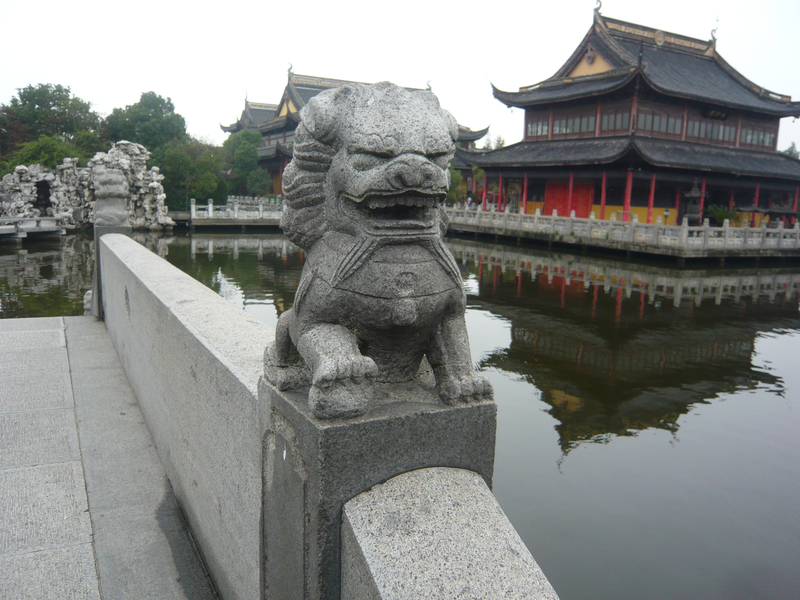 There are 14 historic, elegant stone brides and most were built during the Ming and Qin dynasties (making the bridges between 300 and 400 years old). After passing through the modern part of the town, you reach the water village. 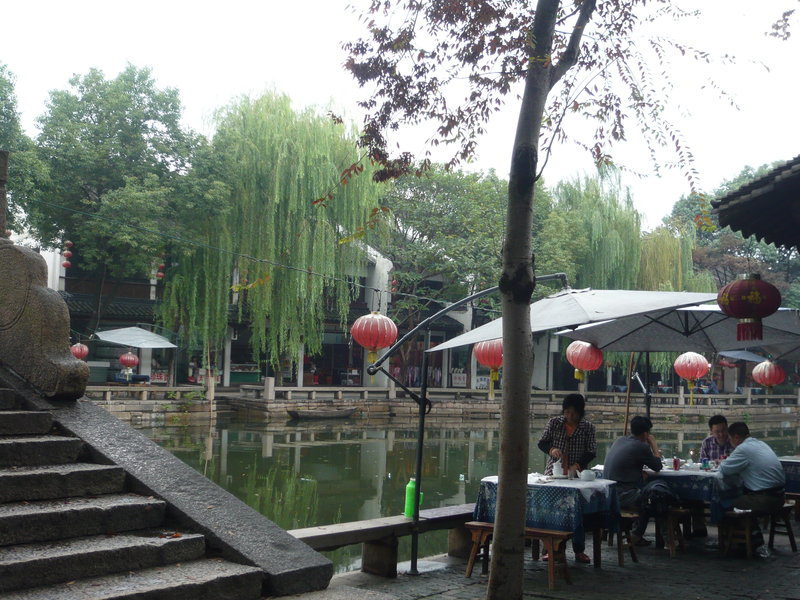 Here is our first glimpse of Zhouzhuang. As we started our tour, we passed by a line of Chinese restaurants right on the canal. There are several specialties of the village including hairy crab (which some tourists come here just to eat), fresh fish picked out fresh from the tank and then killed right before being cooked, crayfish, fresh-water oysters and served at your table, and a kind of bean-sauce pork (legs and feet are the specialties). 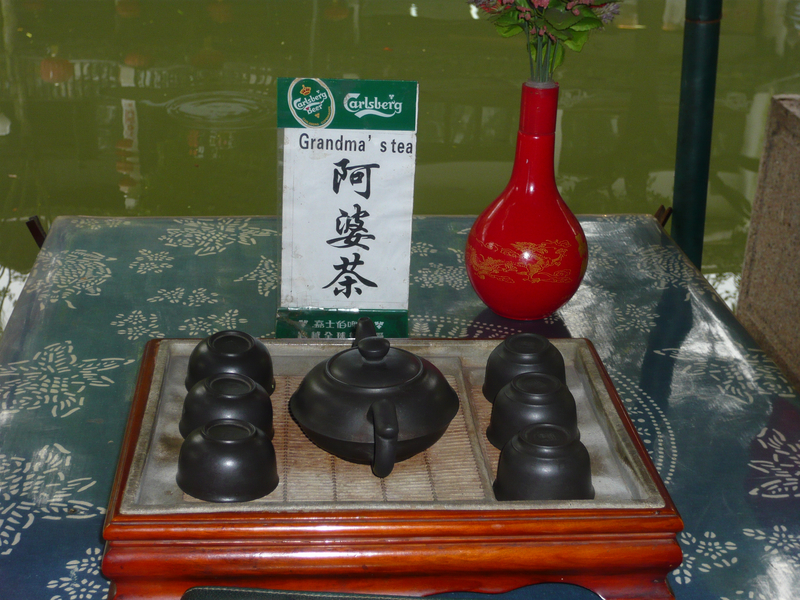 There are a few touristy things such as sitting by the canal and having “Grandma’s Tea”. This is where the elderly woman would sit and relax back in the days. 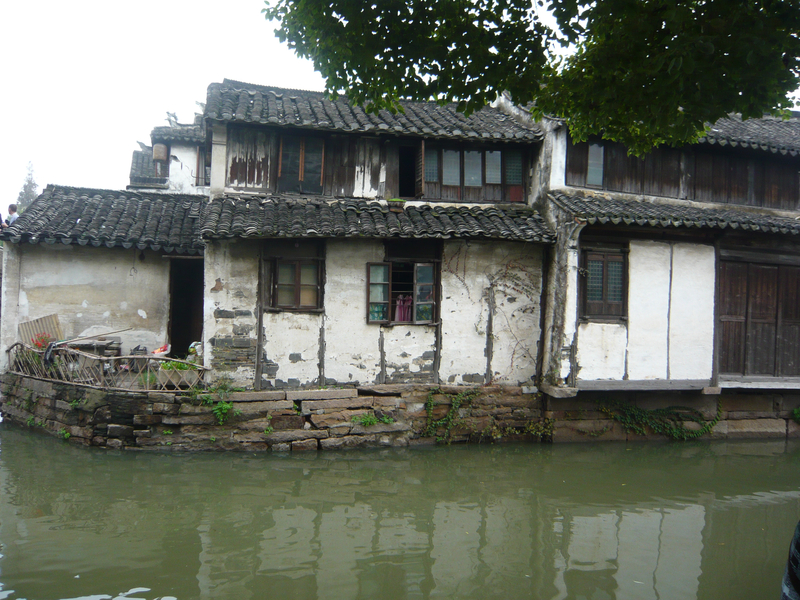 Thirty years ago Zhouzhuang was a small fishing village. It came into the public eye thanks to a Chinese artist who fell in love with its beauty and serenity. He painted several lovely watercolor paintings of the scenic water village. In 1985 he painted a work called “Memories of my hometown” which depicted the sensational beauty of Zhouzhuang and the village instantly became famous. 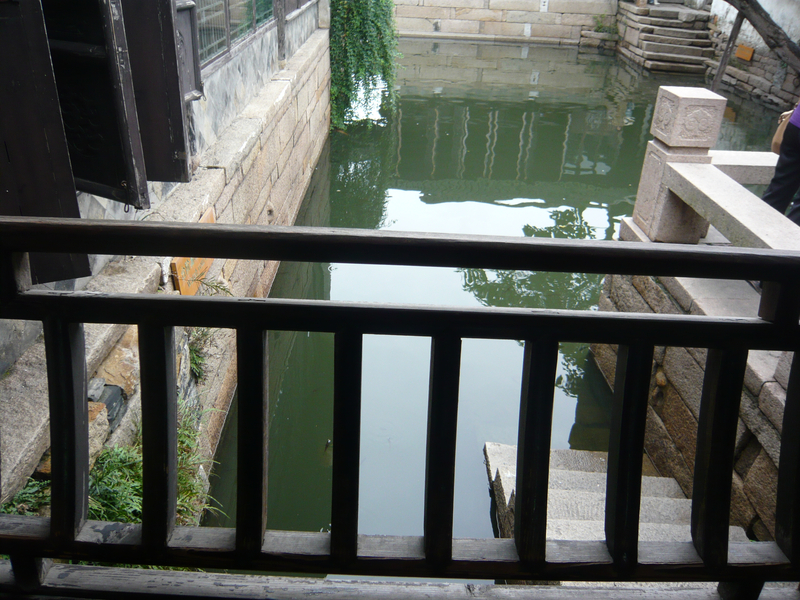 Today, it is one of the top water villages in all of Shanghai. 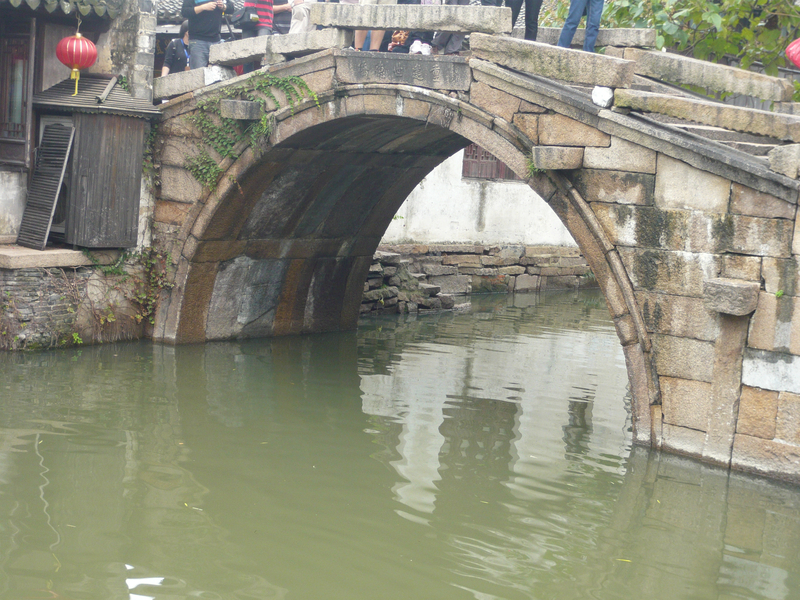 It was a painting of a bridge like this that caught the world’s attention of the beauty and romance of Zhouzhuang. There are over 14 of these gorgeous bridges throughout the water village. All the homes have been left in their traditional splendor. I love this picture above! It captures the magic of this place. After touring the bridges, we next did a tour of the largest home in the village. It was owned by the wealthiest inhabitant of the village back in 1449. The house has a traditional layout of many connecting buildings in which the first room is the tea hall used for greeting friends. I didn’t take many pictures of the home since it was dark inside and relatively crowded. However, below are some of the things I found interesting about the house. Here is the home’s “garage” for their fishing boat. It has steps leading right down to where the boat would be parked. 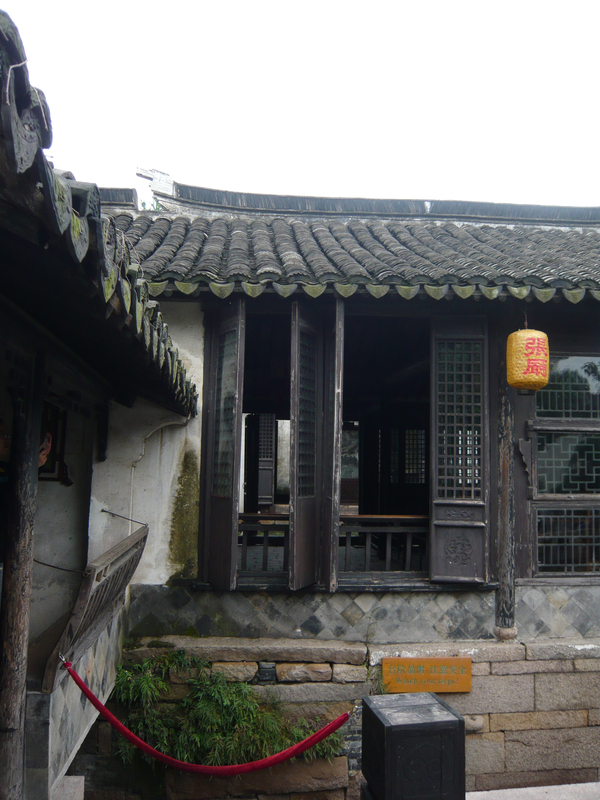 This is the first room or building known as the tea house and used to greet friends and visitors to the home. Many times the guests did not move past this room as the rest of the home was kept private in traditional times. In traditional times, the women of rich families had their feet bond and could hardly walk on their “golden lilies”. 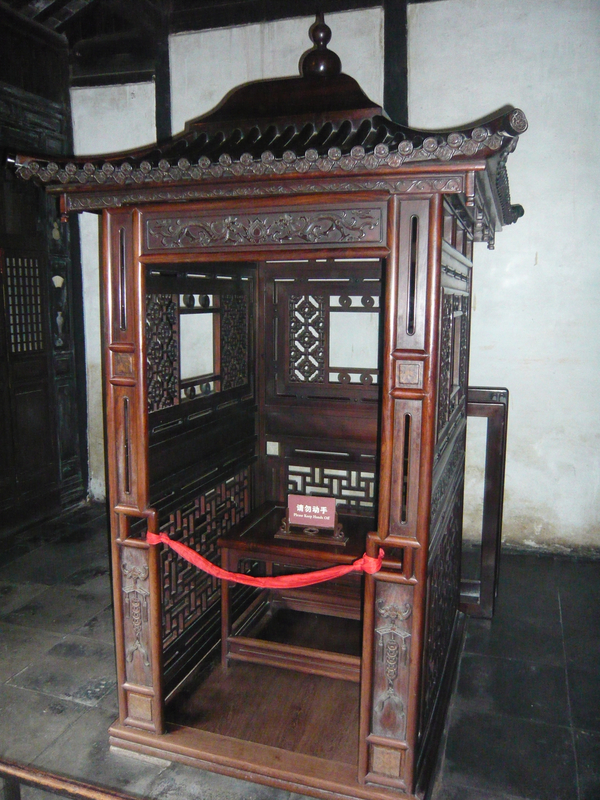 Thus, rich families used the above “sedan chair” as a way to transport the women. Women were also not allowed to show their face to a strange man thus the sedan chair was a way for a woman to remain hidden. 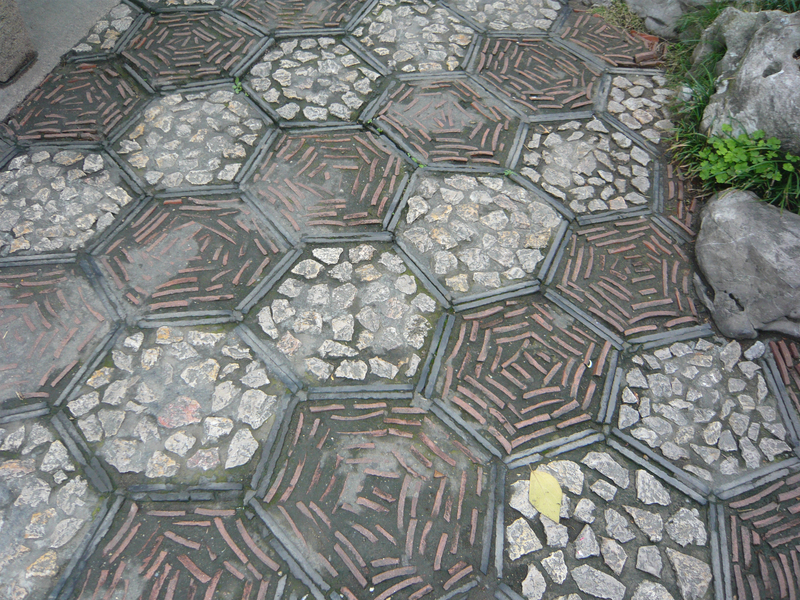 In all traditional Chinese gardens, they incorporated different sizes of stones that could use to massage the feet! In ancient times, Chinese people wore thin cotton slippers that did not have great support. Thus by the end of the day, their feet hurt. To relieve pain, they would take their slippers off and walk barefoot across the stones and get a massage. I tried it and it felt great! 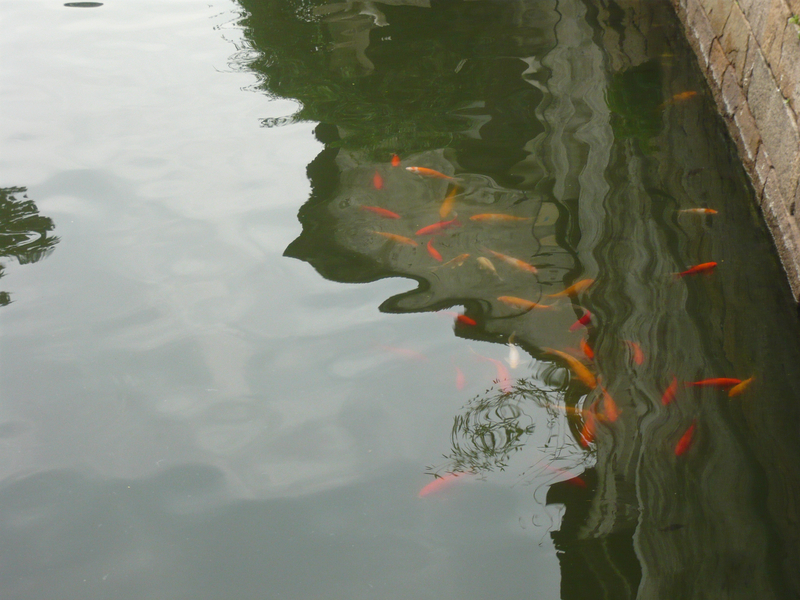 All homes also had goldfish which are considered lucky in China. I noticed that many shops in China have a goldfish next to the cash register (ha ha). 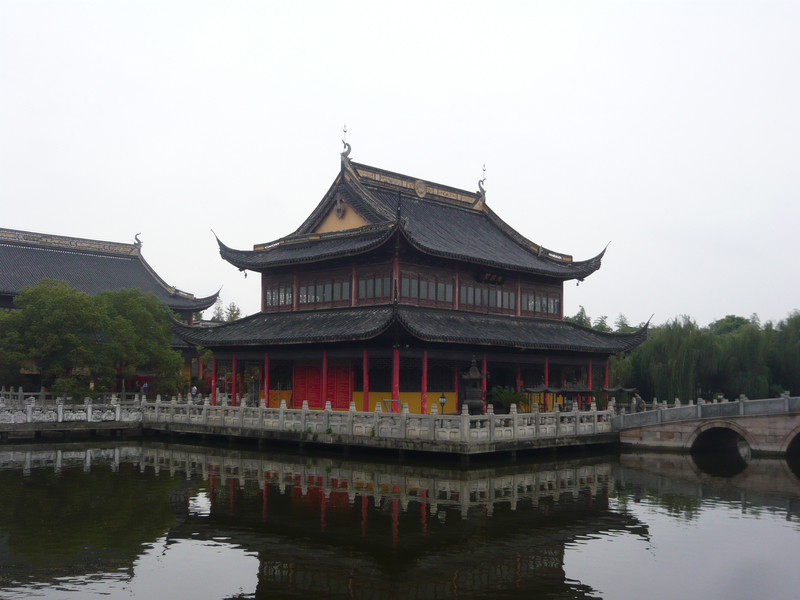 The founder of Zhouzhuang was a devout Buddhist and there are several beautiful temples scattered throughout the canals. 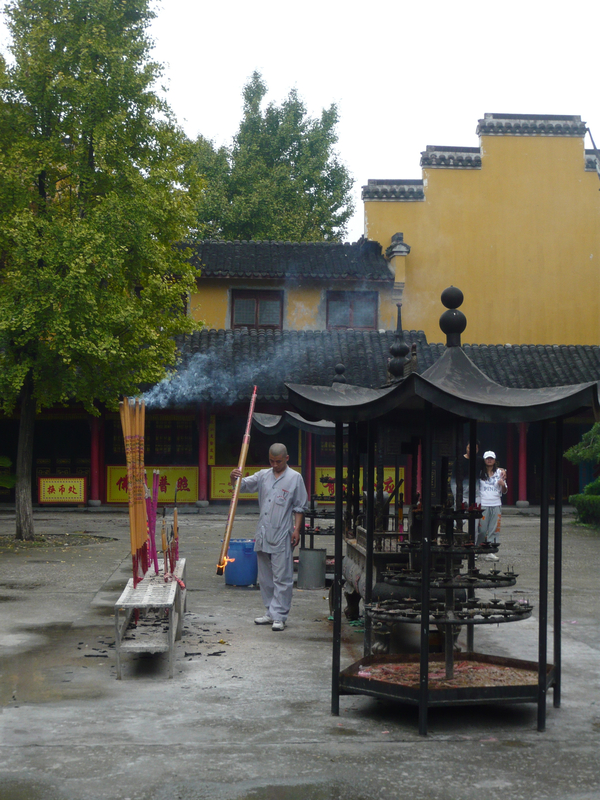 Here are some of my favorite pictures of the Buddhist area of Zhouzhuang. 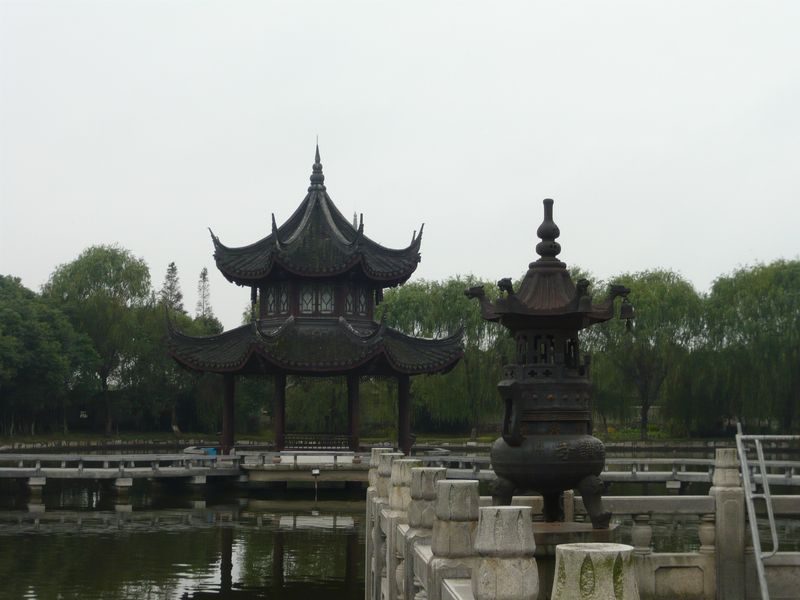 A lovely pagoda for relaxing and enjoying the fresh air. 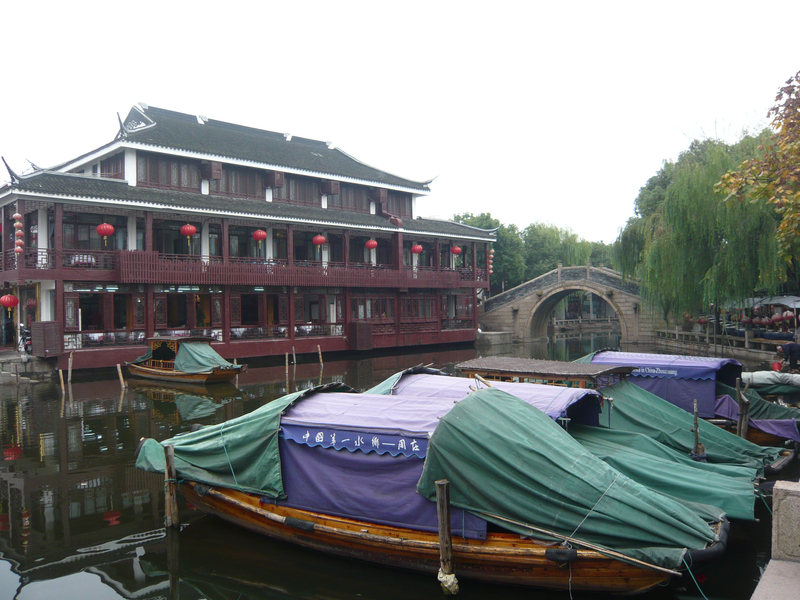 Per Gloria, in ancient times it took four days by boat to reach Shanghai from the water village. Woman in the village were the primary fishers and would head out early in the morning with the little ones in the boat to catch their meals. Here is the way out, towards Shanghai. I wish I could have stayed here all day, relaxing and reflecting on what life must have been like in an ancient Chinese Water Village. But the clock was ticking as was Shanghai’s notoriously bad weekend traffic. It was time to leave. Stay tuned…next post will be Part III: Leaving the water village. Thanks for reading! I have never seen anything like this. thank you for sharing these great pictures. Thanks! I am glad that you enjoyed the post. Feel free to check out some of my older posts on China. Maybe you will like those too! Imagine it taking 4 days to travel 37 miles by boat. Such an interesting detail. Also, I love ths stone patterns in the garden. How incredibly lovely–and practical. I never would have thought they would be used to massage sore feet. Those pictures are fantastic and it looks to be an amazing place. Regarding toilets – you can pretty much lay money on the idea that outside of Tier 1 cities (and often even there too) that public loos are going to range from the disgusting to the disease spreading here. It’s why I won’t go to my wife’s home town – I’m not too proud to admit, I need a proper loo. Ha Ha…really? Are the toilets that bad?! I was hiking in rural Nepal and they were bad since they basically were holes in the ground. But I guess the ones in which many people use in the villages of china are perhaps worse! Yes, it did take some getting used to the toilet situation. BUt after a few days of it, I had no choice and just dealt with it. It wasn’t pleasant though. Especially when there was no running water to wash your hands!